Jupiter is known as the “King of the Planets”, and for good reason. For one, it is the largest planet in the Solar System, and is actually more massive than all the other planets combined. Fittingly, it is named after the king of the Roman pantheon, the latinized version of Zeus (the king of the Olympian gods). Compare that to Earth, which is the largest of the terrestrial planets, but a tiny marble when compared to the Jovian giant. 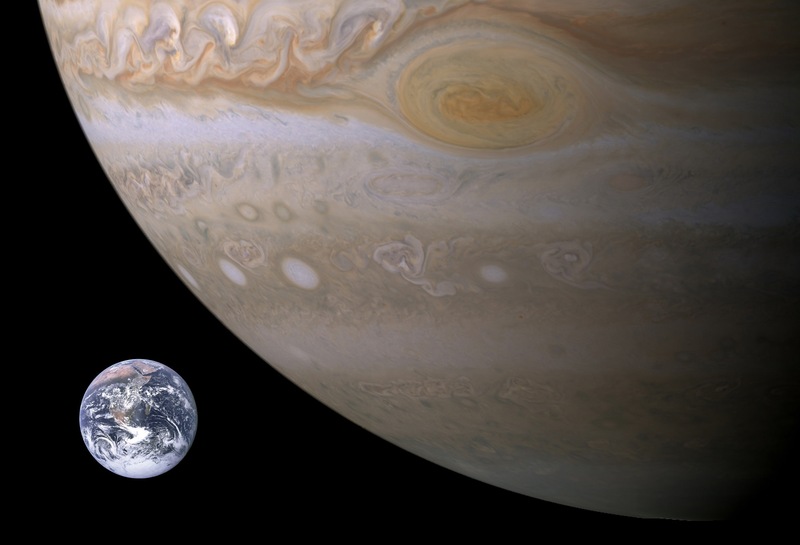 Because their disparity in size, people often wonder many times over Earth could be squeezed in Jupiter’s massive frame. As it turns out, you could it do many, many times over! To break the whole size discrepancy down, Jupiter has a mean radius of 69,911 ± 6 km (60217.7 ± 3.7 mi). As already noted, this is roughly 2.5 times the mass of all the planets in the Solar System combined. Compared this to Earth’s mean radius of 6,371.0 km (3,958.8 mi), and you could say that Earth fits into Jupiter almost 11 times over (10.97 to be exact). And as already noted, Jupiter is more massive than all the other planets in our Solar System – 2.5 times as massive, that is. In fact, Jupiter weighs in at a hefty 1.8986 × 1027 kg (~4.1857 x 1027 lbs), or 1898.6 billion trillion metric tons (2.092 billion trillion US tons). Compare that to Earth, which has a mass of 5.97 × 1024 kg (13.1668 × 1024 lb) – 5.97 billion trillion metric tons, or 6.5834 billion trillion US tons. Doing the math, we then come to the conclusion that Jupiter is approximately 317.8 times as massive as Earth. However, figuring for radius is only useful is you are planning on stacking the Earths end to end across the middle of the gas giant. And comparing their masses doesn’t give you a sense of size, seeing as how the planets are widely different in terms of their density. To know how many Earth’s could truly fit inside in three-dimensions, you have to consider total volume, which you can calculate using the simple formula of 4/3 x Pi x radius2. 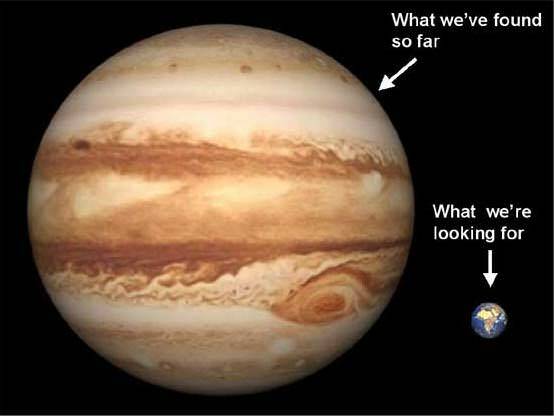 Doing the math, we find that Jupiter has a volume of 1.43 x 1015 km³ (1,430 trillion cubic km; 343 trillion cubic mi) while Earth has a volume of 1.08 trillion km3 (259 million mi). Divide the one by the other, and you get a value of 1299, meaning you could fit almost 1300 Earth’s inside Jupiter. In short, the king of the planets is much, much, MUCH bigger than the planet we call home. Someday, if we ever hope to live around Jupiter (i.e. colonize its moons), we will be able to appreciate just how big it is up close. Until then, these impressive figures will have to suffice! We’ve written many articles about Jupiter for Universe Today. Here’s Ten Interesting Facts About Jupiter, Jupiter Compared to Earth, What is the Diameter of Jupiter?, and How Much Bigger is Jupiter than Earth?